Resource guarding. Some dogs attempt to establish ‘ownership’ or control of food, toys, space or access to a person or other animals. Poor socialization. Both fear of other dogs and bullying behaviors can spark aggression and conflict. Perceived weakness. Sick and aging dogs can trigger aggression in more healthy pack members who seek to eliminate them. Maintain at least one barrier—better yet, two—such as a fence between the established dog and your new arrival. (Alternatively, place both dogs in pens in the same area.) Immediately correct any ‘fence fighting’ that may erupt during this initial exposure. Maintain barriers until the dogs become accustomed to one another’s presence. Boredom is ideal. When removing multiple barriers, take it slowly—one at a time. Wait for any growing excitement that may attend a first barrier removal to subside before removing the second. Remove favorite toys from the area before allowing free interaction. Stay calm. Dog introductions can create anxiety—in everybody! Your calm, reassuring behavior will help calm your dogs. (Conversely, your dogs will absorb any anxiety you experience, raising the chances of conflict.) This means forgoing ‘over managing’ initial greetings between the dogs. Correct aggressive behavior. Intervene in conflict. Otherwise, let your dogs be dogs. Once introductions are over and matters settle, ensure you continue to provide at least as much attention and affection to your established dog as the newbie going forward. Until you are certain the dogs are well adjusted to one another, have them return to separate crates or pens during periods of excitement, such as at meal time or the arrival of visitors—who during their stay may later hand out treats to lucky Basenjis. Unfortunately, and whatever the measures taken to curb conflict, fights can erupt between dogs in the same space. Fights can be scary. And they can be dangerous—scores of owners have been bitten attempting to separate fighting dogs. But separating them is a must. What to do? Prepare ahead of time. Until you are sure your resident and new dogs are ‘best buds’, have each wear a 3 to 4 foot leash connected to a flat snap collar (for emergency release). If they get into a spat, the leashes simplify separating the dogs from a safer distance. If outside, keep garden hoses available (and ready). A strong dose of spray can cause a distraction—pausing the dust-up—simplifying separation. Preempt conflict. If two dogs are exhibiting signs of aggression—or even strange behavior—separate and redirect them before a fight happens. Work in twos. Assign one human to gain control over each dog. Approach from the rear. 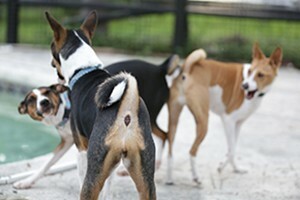 Have each person grab the rear legs of their assigned dogs and back away, separating the dogs. Once they are apart, keep them apart. Maintain separation until the momentary excitement of the fight has degenerated into boredom. If the fight was especially serious, or aggression soon returns, consider repeating a slow introductory period. If aggression problems persist, seek help from a professional, certified trainer.